Between its world-famous architecture, bustling tourist attractions, beaches, and surrounding natural beauty, Barcelona is the perfect metropolitan city for sight-seeing. To get an amazing panoramic view of the whole seaside metropolis, you can't do better than Mount Tibidabo. Visible by its church spire from literally anywhere in Barcelona, Mount Tibidabo is Barcelona's tallest peak at 515 meters and has some of the city's best views. It also has its own amusement park, and the church is absolutely stunning. If you find yourself wandering Barcelona for any reason, Tibidabo rewards closer inspection—and it's only a ten-minute ride on the train from the city center. 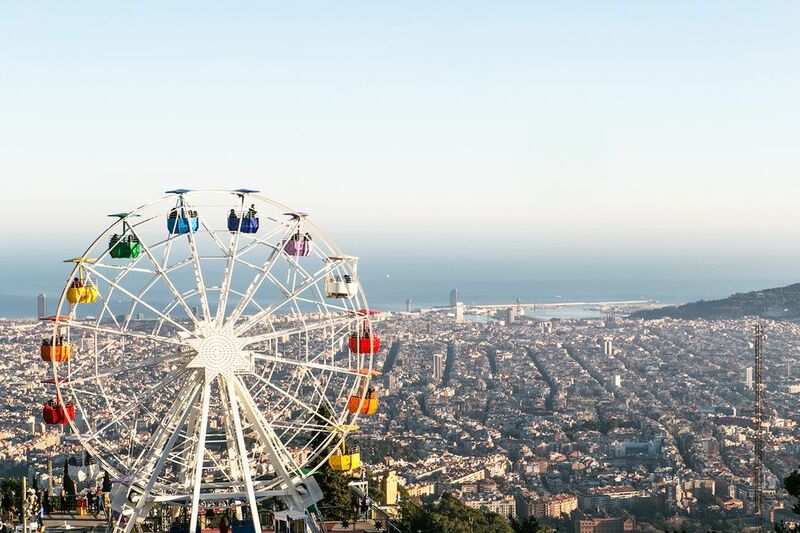 Tibidabo's funfair combines spectacular views of Barcelona with child-like adrenaline rushes. The park's six different zones boast exciting rides such as the Russian Mountain, the Pirate Ship, and the Hurricane. The park is open on Saturdays, Sundays, and some bank holiday Mondays. At the site where Catalan legend claims Jesus was tempted by the Devil, it's fitting there is a fairy-tale church. The Temple of the Sacred Heart was designed by Enric Sagnier i Villavecchia and built between 1902 and 1961. The interior features amazing murals, colourful mosaics, and a neobyzantine crypt. The church is also one of Barcelona's most controversial buildings. Separated from the Tibidabo summit by a kilometer is Sir Norman Foster's award-winning Communications Tower (or Torre de Collserola), which has an observation deck on the 10th floor. On a clear day, you can see up to 45 miles away—including Collserola Park, Montserrat, and even the Cadí-Moixeró mountain range. Viator offers a walking tour of Tibidado, if you wish to get the low-down from a local guide and explore every nook and cranny the area has to offer. This particular tour is perfect for outdoorsy types, as it includes an excursion in the Collserola Nature Park. If you're not up for the somewhat lengthy hike, the best way to get to the top of Tibidabo is in two chunks: the first by tram, the second by funicular railway. At Avinguda Tibidabo FGC Station (which connects by rail via Line 7 to Plaça Catalunya) you can hop on a Tramvia Blau (old-style tram), which winds its way up past some of the city's most amazing mansions. Halfway up the side of the mountain at Plaza Doctor Andreu the tram stops. Here, the funicular train goes straight up to the top of Tibidabo, emerging beside the church and amusement park. This part of the journey covers just over a kilometre. The train been in service since 1901, making it one of Spain's oldest funiculars. Or, you can take the Tibibus from Plaça Catalunya, at the corner with Rambla Catalunya, or the FGC from Catalunya to Avinguda Tibibado. The Barcelona Metro is super easy to maneuver and has plenty of signs in both English and Spanish.